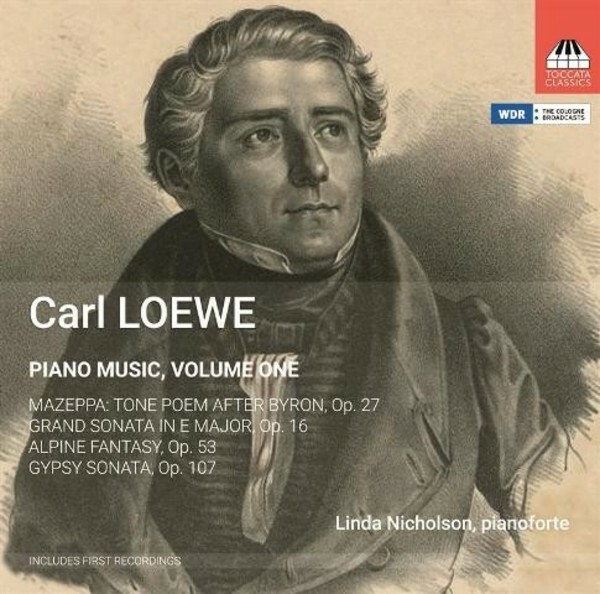 Carl Loewe (1796–1869), known ‘the north German Schubert’, is remembered today chiefly as a composer of ballads. Yet there is a considerable body of piano music that is strikingly innovative in content, expression and harmony. It contains the germs of ideas later taken up by composers such as Wagner and Liszt. Loewe was unquestionably a brilliantly original talent, a major figure in ushering in the Romantic era. This is the first recording in a series recording in conjunction with Westdeutscher Rundfunk in Cologne. Linda Nicholson is one of the foremost keyboard players specialising in the performance of Baroque, Classical and early Romantic music on instruments of the period. She won the first two international competitions held for the fortepiano, the Concours International du Pianoforte in Paris and the Festival of Flanders Competition in Bruges, and since then has performed in major festivals and concert series throughout Europe and the Far East. Her broad repertoire encompasses solo works, chamber music and concertos.